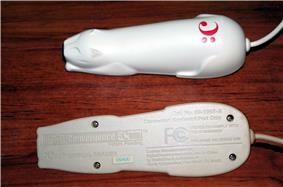 The CueCat, styled :CueCat with a leading colon, is a cat-shaped handheld barcode reader that was released in 2000 by the now-defunct Digital Convergence Corporation. The CueCat enabled a user to open a link to an Internet URL by scanning a barcode — called a "cue" by Digital Convergence — appearing in an article or catalog or on some other printed matter. In this way, a user could be directed to a web page containing related information without having to enter a URL. The company asserted that the ability of the device to direct users to a specific URL, rather than a domain name, was valuable. In addition, television broadcasters could use an audio tone in programs or commercials that, if a TV was connected to a computer via an audio cable, acted as a web address shortcut. The CueCat connected to computers using the PS/2 keyboard port and USB, and communicated to desktop "CRQ" software running on Windows 32-bit and Mac OS 9 operating systems. Users of this software were required to register with their ZIP code, gender, and email address. This registration process enabled the device to deliver relevant content to a single or multiple users in a household. Codes can no longer be generated for the device. However, third-party software can decode the lightweight encryption in the device. A CueCat "cue". The bars are tilted 22.5° to the left, both for stylistic reasons and to avoid Lemelson parallel barcode patent concerns. The CueCat was invented by J. Jovan Philyaw, who changed his name to J. Hutton Pulitzer. Belo Corporation, then parent company of the Dallas Morning News and owner of many TV stations, invested US$37.5 million in Digital Convergence, Radio Shack $30 million, Young & Rubicam $28 million and Coca-Cola $10 million. The total amount invested was $185 million. Starting in late 2000 and continuing for over a year, advertisements, special web editions and editorial content containing CueCat barcodes appeared in many U.S. periodicals, including Parade magazine, Forbes magazine and Wired magazine. The Dallas Morning News and other Belo-owned newspapers added the barcodes next to major articles and regular features like stocks and weather. Commercial publications such as AdWeek, BrandWeek and MediaWeek also employed the technology. The CueCat bar codes also appeared in select Verizon Yellow Pages, providing advertisers a link to additional information. For a time, RadioShack included these barcodes in its product catalogs and distributed CueCat devices through its retail chain to customers at no charge. CueCats were also bulk mailed (unsolicited) to certain mailing lists, such as subscribers of Forbes and Wired magazines. In the Wall Street Journal, Walter Mossberg criticized CueCat: "In order to scan in codes from magazines and newspapers, you have to be reading them in front of your PC. That's unnatural and ridiculous." Mossberg wrote that the device "fails miserably. Using it is just unnatural." He concluded that the CueCat "isn't worth installing and using, even though it's available free of charge". Joel Spolsky, a computer technology reviewer, also criticized the device as "not solving a problem" and characterized the venture as a "feeble business idea". The data format was proprietary, and was scrambled so the barcode data could not be read as plain text. However, the barcode itself is closely related to Code 128, and the scanner was also capable of reading EAN/UPC and other symbologies. 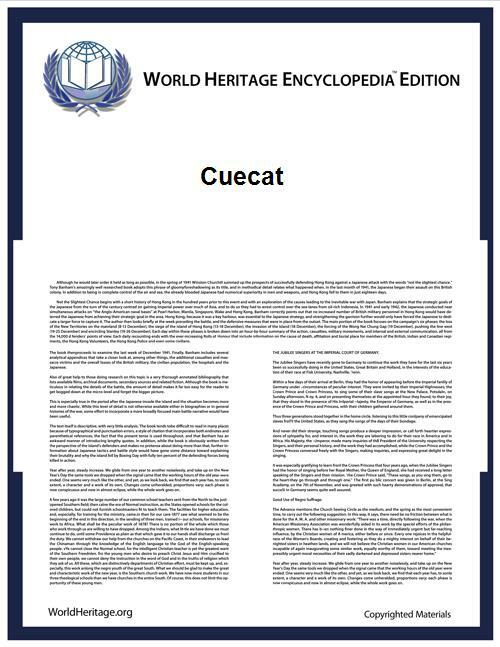 Because of the weak obfuscation of the data, meant only to protect the company under DMCA guidelines (like the DVD protection Content Scramble System), the software for decoding the CueCat's output quickly appeared on the Internet, followed by a plethora of unofficial applications. The CueCat is widely described as a commercial failure. It was listed as one of "The 25 Worst Tech Products of All Time" by PC World magazine. The CueCat's critics said the device was ultimately of little use: Jeff Salkowski of the Chicago Tribune wrote "You have to wonder about a business plan based on the notion that people want to interact with a soda can," while Debbie Barham of the Evening Standard quipped that the CueCat "fails to solve a problem which never existed." In December 2009, the popular gadget blog Gizmodo voted the CueCat the #1 worst invention of the "2000s" decade. A CBS News piece describing RadioShack's 2015 Chapter 11 bankruptcy lists the CueCat as just one of a long string of marketing failures which contributed to the chain's demise. The CueCat device was controversial, initially because of privacy concerns of its collecting of aggregate user data. Each CueCat has a unique serial number, and users suspected that Digital Convergence could compile a database of all barcodes scanned by a given user and connect it to the user's name and address. For this reason, and because the demographic market targeted by Digital Convergence was unusually tech-savvy, numerous web sites arose detailing instructions for "declawing" the CueCat — blocking or encrypting the data it sent to Digital Convergence. Digital Convergence registered the domain "digitaldemographics.com", giving additional credence to privacy concerns about the use of data. The company's response to these hacks was to assert that users did not own the devices and had no right to modify or reverse engineer them. Threats of legal action against the hackers swiftly brought on more controversy and criticism. The company changed the licensing agreement several times, adding explicit restrictions, apparently in response to hacker activity. Hackers argued that the changes did not apply retroactively to devices that had been purchased under older versions of the license, and that the thousands of users who received unsolicited CueCats in the mail had neither agreed to nor were legally bound by the license. No lawsuit was ever brought against "hackers," as this tactic was not employed to go after specific users or the hacker community specifically, but to show "reasonable assertion" that would prevent a corporation from developing integrated software within an operating system or browser which could take over the device and circumvent the CRQ watchdog software and therefore revenue model that Digital Convergence employed. Investors in CueCat lost their $185 million. Technology journalist Scott Rosenberg called the CueCat a "Rube Goldberg contraption", a "massive flop" and a "fiasco". In September 2000, security watchdog website Securitywatch.com notified Digital Convergence of a security vulnerability on the Digital Convergence website that exposed private information about CueCat users. Digital Convergence immediately shut down that part of their website, and their investigation concluded that approximately 140,000 CueCat users who had registered their CueCat were exposed to a breach that revealed their name, email address, age range, gender and zip code. This was not a breach of the main user database itself, but a flat text file used only for reporting purposes that was generated by ColdFusion code that was saved on a publicly available portion of the Digital Convergence web server. Digital Convergence responded to this security breach by sending an email to those affected by the incident claiming that it was correcting this problem and would be offering them a $10 gift certificate to Radio Shack, an investor in Digital Convergence. In 2001, Computerworld named CueCat as a Laureate in the Media Arts & Entertainment category. In June 2005, a liquidator offered two million CueCats for sale at $0.30 each (in quantities of 500,000 or more). The bar code scanner itself is still being sold on secondary marketplace sites like Amazon and eBay. The booklover social networking site LibraryThing sells USB CueCats to aid with scanning ISBN barcodes for entering books into the site. Technologies popularized in the years after CueCat provide some of the same features for consumer bar code scanning and web-connected interaction. The QR code and the Microsoft Tag have been described as "similar projects" to CueCat. ^ Kaufman, Leslie (October 6, 2000). "Speaking in Bar Code; Personal Scanners Link Products Directly to Consumers". ^ Stepanek, Marcia (September 28, 2000). "The CueCat Is on the Prowl: This gizmo is on the cutting edge of e-marketing. But with each swipe, it tracks your moves through cyberspace". ^ Celeste, Eric (April 10, 2003). "Crystal Clear". ^ Meyer, Katherine (May 3, 2006). "The Best of the Worst: CueCat Falls Flat". ^ Spolsky, Joel (September 12, 2000). "Wasting Money on Cats". joelonsoftare.com. Retrieved November 12, 2011. ^ Kevin Poulsen (2000-09-19). "Hackers skin CueCat". Securityfocus.com. Retrieved 2015-02-15. ^ The 25 Worst Tech Products of All Time, PC World, May 26, 2006. Retrieved 2011-04-04. ^ Evening Standard, October 16, 2001. Cited at Slashdot forum. ^ Aimée Picchi (2015-02-03). "5 mistakes that doomed RadioShack". CBS News. Retrieved 2015-02-15. ^ "A eulogy for RadioShack, the panicked and half-dead retail empire". SBNation.com. Retrieved 2015-02-15. ^ "Use Of Free Bar-code Scanners Turning Into A Cuecat Fight". Chicago Tribune. 2000-10-09. Retrieved 2015-02-15. ^ . This is one of the alerts sent to Securitywatch.com after other attempts to contact Digital Convergence failed. ^ "A Search for New Heroes". Computerworld Honors. Retrieved November 7, 2011. ^ "Two million CueCats at $0.30/each". Boing Boing. Archived from the original on 2009-02-20. ^ Schubert, Siri (April 1, 2007). "Beating Oprah at the book club game". ^ Lardinois, Frederic (January 8, 2009). "Microsoft Tag: The CueCat Returns on Your Mobile Phone".